Iyana is a student at Sto-Rox High School. She decided to participate in Learn & Earn because she wanted to earn her own money as well as get a jump start on building career skills. When Iyana first found out she was going to be working at Goodwill, she assumed she would be working in a thrift store. She was surprised to learn that Goodwill is much more than a store, and that her job would be administrative. 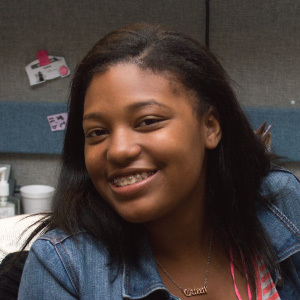 During her time at Goodwill, Iyana learned how to take inventory, file, and handle mailings. Iyana is proud to be leaving Goodwill with a resume full of new skills!